The object of Daring Dave and the Eye of Ra is to obtain a winning symbol combination by spinning the reels. A game with an adventure movie them and feel. Imagine Indiana Jones and the Temple of Doom and you won't be far away. 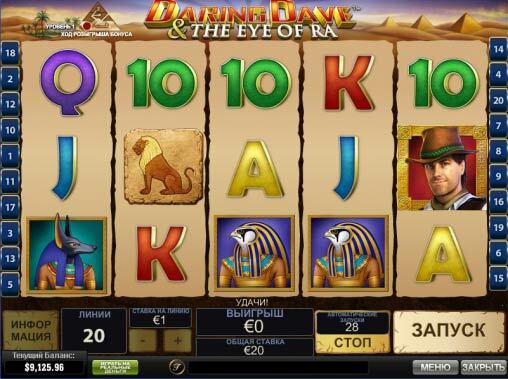 Great graphics in this 20 payline video slot with increasing bonus feature. The idea of the game is to work your way through the four bonus levels until you eventually meet and defeat the EYE OF RA. Each bonus leve game will remember where you last finished and start you again. 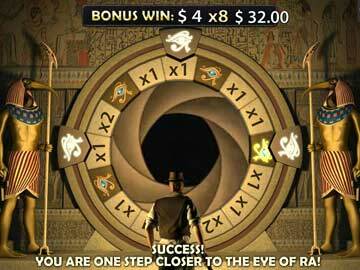 Keep collecting symbols and clues on the reels to help you through the bonus levels.